There’s a tree outside my bedroom window with one leaf on it. This one leaf will not let go. I mentioned I was on a journey to find my true colors. No longer hidden by green chlorophyll, this leaf found its color. It’s red. But it’s not letting go. 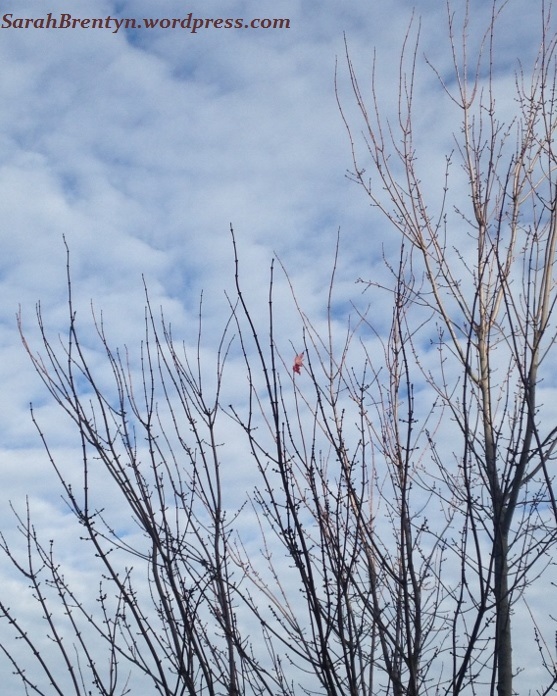 Every morning, I see this stubborn autumn leaf. It hangs on, clinging to a thin branch. I check on it after rain, after heavy winds—and there it is. Still on its tree in mid-December. I said I was a leaf. I think I’m this one. The one that won’t let go. Why am I holding on to who I was? People change. Priorities change. Experiences shape and reshape us. Why do we resist? Is it difficult to accept? Do we become complacent? Are we uncomfortable admitting we are not who we thought we were? I’m thinking all of these are rooted in fear. So, while I’ve found some of my true colors, I’m finding it difficult to let go. A friend asked me why I continue thinking of myself as a woman I clearly no longer am. I didn’t have an answer. But now I know that I am afraid. Do you have difficulty letting go of who you were? Why? What is stopping you from moving on? Beautiful analogy, Sarah. I think the knack is to see the letting go as an unlimited adventure. The world changes then. Thanks, Sue. ❤ Ah. An adventure. I like that. Now, if I could just let go so I can enjoy that adventure! Just close your eyes and jump… anything else is making it harder. I went from senior exec in suits and heels to what looks like a big step down the social and economic ladder. I can say, hand on heart, I have never been this happy in all my life. I love hearing that you have never been happier. I will close my eyes if need be but I will jump. This is really weird because I am going through similar feelings. I am letting go of who I used to be (corporate, high heeled, business suited, dull person) to someone more creative, someone who wants to follow her writing dream. I know that I have to follow this creative path and I am losing some acquaintances in the process. Your beautiful leaf story has resonated with me. Thank you! I am, too! I had another post planned about my crisis and transformation but I had to write about that tree. It’s huge and seriously has one leaf on it. I changed my mind and wrote this post this morning. You are a little weird but that’s because I think all good writers are. You aren’t weird for wanting to be one. So many of us introverted, quirky, odd writers can look back and see the child they were who wanted to be a writer. And many can say it’s who they are. I like the “real” Lucy. I think your colors are beautiful. Thank you for writing this. Because I know just how painful it is to admit the feeling that resonates from the emotions behind this. I think you’ve seen enough of my poetry to know this is a core theme in many of them. I don’t think I ever can come to grips with the idea that I am not physically who I used to be….mentally and deep in the core of who I am, I have never changed. As the years press on, I find I just keep tightening my grip on the things that seem like they are never going to let go of me. And in a way sometimes I feel like I’m trapped by them and can’t become who I’ve meant to be now. I have a lot of perceptions about love and happiness that haunt me from my younger days. And a lot of demons that continue to complain that i’ve betrayed things I resolutely declared I would never compromise. Time is unforgiving where dreams are concerned. I’m afraid a lot of times I’ve compromised too much of myself for what everyone around me believes I should be. There are a lot of times I am very much afraid that I can’t be the man I am supposed to be, ever. I wish you peace, Sarah. “mentally and deep in the core of who I am, I have never changed.” This is interesting. It’s true and can be looked at in a positive way that makes me think “deep down” I’m the same person so what does it matter if external circumstances are different and have changed me a little? On the other hand, it’s just this that is one of the reasons it’s tough to let go. I am the same person in some ways. "Time is unforgiving where dreams are concerned." A hard truth. You always make me feel like things are not as bad as they seem. For that, Sarah, I thank you. Beautiful post Sarah! I love the way you use the leaf to reflect the way we hang on. What are we hanging onto? I don’t believe we were never meant to stay the way we ‘were’ – at whatever point in life that may be. We are meant to grow, learn, change and let go. It’s who we become that’s important – and in the present moment, who we’ve become is always who we are. Oh, your leaf will let go; when it’s the right time for it to do so. Thank you, Kate. ❤ What are we hanging onto? I don't know. Because I truly believe we are constantly changing, learning, and growing as people. I always thought we who we are is a combination of who we once were, who we are, and who we will become but I do like your beautifully simple idea that who we’ve become is who we are — in this moment. I really love how you’ve put this. I know I am afraid of change. Letting go of the person I’ve been for so long to become someone I don’t know yet is scary. It’s going to be scary. But what’s worse? Staying as I am, or embracing the fear and going with the change? Hi Sarah, there’s a lot in your post that I empathise with… Fear can be paralysing. I actually wrote something a couple of months back on being the last leaf on the tree in slightly more final circumstances. That’s a sad piece. Though could be taken as a change — a metaphorical death. Either way, I like it. Thanks for sharing. Oh, yes, fear can be paralyzing. It really can. See if wonder if the trouble is the tree that won’t let go. It’s the tree that’s scared and you have to wait for it to be ready or persuade it to see things your way. Make it understand there’s a time to hang on and a time to let the leaves move on. If it doesn’t it can’t regenerate a new leaf. Everything around you holds you in place as much as your own inertia. When those bindings loosen it is time. And sometimes nature helps with wind and rain to accelerate the decoupling and sometimes tree and leaf know and it happens. I suspect this is all Bull but it sounds right. But all means struggle but not so much that the leaf tears. Sounds lovely, Geoff, and links so well with your latest post (although with the speed your block moves on it probably 5 posts ago by the time this gets registered) on letting your son go. Haha! 😀 Probably. And I missed it so I must go read that one. Blown. Away. (Not unlike a dry autumn leaf, mind you.) Seriously. This is a fantastic twist. What if it IS the tree? What if I’M the tree? What if I won’t let go of that last bloody leaf because of so much loss? Because so much has already changed and I have that one thing to hold on to? But, if I let it go, I can make way for a new leaf? I need to think on this one, Geoff. You’re right with the end there, for sure. It will be a struggle but I do need to take care that the damn leaf doesn’t get shredded in the process. Thanks. It seems such a big process we go through to finally see our true colors and then we find that we have a grip to the old. And I really like what Anne Goodwin expresses on her website, “the freedom to contradict herself.” So, sometimes it’s okay to be both the bold leaf, and the stubborn one. Transformation is one leaf at a time. Beautifully expressed thought bubble! Yay, Charli, so honoured to have that scrap of what used to pass for my non-bio quoted! But yeah, ambivalence rocks! It is a process then, you’re right, we find them and realize we’ve got a death grip on the old ones. I love that idea: the freedom to contradict myself. I suppose we can be both those things…stubborn and bold. I like it. ❤ Thanks, Charli. We resist because it is safe and it is known. Taking that leap into the unknown is exactly what you diagnosed – Fear, but It depends on how you approach fear. If you take it as ‘False Experiences Appearing Real’ then you are afraid to go forward. If you turn around your thinking and take it as ‘Feeling Excited and Ready’ you can go into the future with anticipation, ready to take the risk. We all change as we get older and perhaps we change depending on who we are with and who we want to be. I know I don’t recognise some of my younger selves. I don’t know whether I dislike them but I know the best of life happened when I embraced the fear and allowed who I wanted to be shine through. Although that leaf could also represent resilience because you need that also. I could go on but fearing I will start to waffle will leave it there. Good luck Sarah with your quest. Yes, it is safe and known but, yes, it is fear. All just fear. I love your definitions of (or approaches to) F.E.A.R. Agreed that we all change as we get older. And thank goodness for that. How dull life would be if we didn’t. So why is such a natural progression/process so scary? I hadn’t thought of the leaf being resilient. I mean, watching it cling to that thin branch for so long with winds and rain, of course I had but what really stayed with me was that it wouldn’t let go. Which tells you a bit where my mind is. And yours. ❤ Thanks, Irene. Change is scary because it is unknown. Some risks have to be taken though in order to live. I wrote some of my thoughts on risk taking in 2014. It is an interesting observation that our response to the leaf hanging on could have quite different meanings for both of us. You know, I must be that stubborn leaf sitting atop the tree waiting to experience my first snowy day. All the other leaves have succumbed with fear, but not I. Just because all the others have run away, why should I? I never wanted to sit in the box the same as everyone else. I wanted to question, to see the world from another perspective. Trust me to interpret your tree differently. You could hardly have expected me to do anything else. How many wishes does it take to make a leaf fall? Maybe just one, but the leaf has to want to fall. (with apologies to light bulb jokes). I love the depth of your philosophical musings in this post. It is certainly food for thought. And change is difficult, but if you orchestrate the change, is the change really who you are, or merely who you think you wish to be, someone other than you? Sorry, Sarah. This is probably the most disjointed and least lucid of all the responses, but you got my mind bouncing around in many different directions. While the leaf stays steadfast! You flipped this on its head like Irene! 🙂 The leaf’s not afraid, it’s resilient. I love these Thought Bubbles so much. They bring out such interesting comments and discussions and, often, more Thought Bubbles. Ah! If you force the change, is the change really you or are you just the impatient person who forced it along? Food for thought, indeed. (It’s really not a disjointed comment at all. Makes perfect sense to me. And I love that this got your mind moving…) Thank you. Ha! Two Australians flipped it on its head. Is that why “they” say we come from the land downunder? That’s funny. Funny, Sarah, although you linked it to your previous post, I didn’t see this hanging on as negative at all, I saw that a single leaf as persisting through the difficulties when others had just fallen to the ground. I’d also add, from my ex-professional and personal experience of therapy, change is really hard, and especially hard if you are trying to do it by yourself (not to dismiss the support you get in from the blogosphere) and like Charli says above, sometimes finding ways that you can keep a foot in both camps is really helpful. No, not to dismiss the blogosphere but, really, it is difficult when you are alone in all this. I’m a little late to this post, but it’s just lovely. You say so much with so few words – I appreciate the economy in your prose. And what you say resonates for me and many other people, I’m sure. Thanks for sharing, Sarah. Aw, thanks. 🙂 I do enjoy writing these thoughts (and trying to keep them under 200 words). Sometimes it’s tough but I like the challenge. Far is an all too common thing, especially when it comes to facing change. For me, this coming year I’ll be facing major changes in my life, but I’m still me. There are parts of me that evolve, others that are pillars that remain, and some parts I can’t let go of, even though I’m trying with all my might. Letting go of some things is truly hard, even if it’s to be better, to be happier and I think some things are hard to let go because of how they once were. One of those aspects in me was pure bliss….. and it got damaged along the way. The more I let go, the better I feel… yet I still hold on. Wishing for that part of me to also evolve, to catch up… or maybe I don’t want to say goodbye to that part of me, or that person whom it’s attached to. For me, I always consider myself a constant evolution. I have ups and downs, some days I do fantastic while other days I feel like an embarrassment to the human race. I think I find it hard to let go of certain things, but that my identity has deep roots that don’t respond or conform to anyone’s expectations. That helps me to always be me, but like I said, some days are better than others. 😀 I highly doubt you are ever an embarrassment to the human race. Yes! Constant evolution is good. It’s difficult to let go of certain things but our identity, who we are, has deep roots. Exactly.